They’re ugly. They’re stupid. They shout “Grr!” and “Argh!” and the only thing they ever think about is the next human they’re going to dine on. You’d think these one trick ponies’ fifteen minutes of fame would’ve dried up by now, but forty-seven years since George Romero’s Night of the Living Dead introduced zombies into mainstream pop culture in 1968, the fan base for these vile beasts has grown stronger than ever. AMC is in full-swing, not only with The Walking Dead but an additional spinoff series, Fear the Walking Dead. Both programs follow groups of human zompoc survivors who have given up their hopes and dreams, their only focus now being how to keep themselves from becoming zombie chow. You’ll find zombies at the box office, and not just the ones trying to eat your brains while you’re trying to eat your popcorn. Brad Pitt, Hollywood’s top leading man, believed zombies were bankable enough that he starred in World War Z, a screen adaptation of Max Brooks’ novel about a world overrun with vile, coldblooded fiends. Even Arnold Schwarzenegger got in on the zombie action this summer with Maggie, the story of a father who wants to save his daughter who has turned into a zombie. No, not as in the typical “spends too much time on the phone and social media” kind of teenage zombie but a “I want to bite your face off” zombie. Resident Evil, Left 4 Dead and Dead Rising put players in situations where they have to use their ingenuity and the tools around them to survive. Personally, I think the original Dead Rising, which put players in a zombie infested mall and asked them to escape with all the products and tools in a large shopping center at their disposal was as ingenious as it was fun and scary. Here’s where #31ZombieAuthors come in. It all began as a fun idea. I’d write a story in which I, Bookshelf Q. Battler, am trapped in the midst of a zombie apocalypse, and have to contact one author per day for help. Seemed like a cool way to promote the blog around Halloween time. Initially, I thought that I’d contact a few authors, they’d all tell me no, then I’d give up and move on to something else. Instead, I was blown away by how many professional, established writers were willing to donate their time to this project. I contacted these folks cold. I introduced myself just as I am – Bookshelf Q. Battler, World Renowned Poindexter and Blogger-in-Chief of the Bookshelf Battle Blog. I didn’t offer my so-called “real name.” And no one asked for it. Not a one of them was like, “Well, I’ll do it if I know who you really are.” I don’t know why anyone would ask me that anyway. I really am Bookshelf Q. Battler. In a way, that made me happy, that all these fine scribes were willing to trust me, a guy they don’t know, who claims to own a magic bookshelf and be the best friend of an alien. I like to think that means I must be doing something right around here since these fine individuals deemed me worthy of their precious time. I offered them nothing. I was upfront with the fact that my blog caters to a modest audience of 3.5 readers, so it wasn’t like they could expect a surge in book sales. They all just cared enough to want to help an aspiring writer out. Honestly, I’m probably getting more out of this than they will. That fact alone makes them all pretty cool people. THE MOST AMAZING PART OF ALL OF THIS? Thirty-one (actually thirty-three as I’ll be interviewing two writing duos) came together on very short notice and helped me put together a massive undertaking within about a month. If ever you doubt there’s a generous online community for writers, think about that. They all come from different backgrounds and walks of life. Our interviewees include a cop, soldiers, full time mothers, preppers, podcasters and yes, there might even be a nerd or two. They’re from America, England, Australia, and Canada. All different ages. All united by a common love of undead creatures that want to munch on your brains. More importantly, they’ve all brought their own unique experiences, style, and voice to the zombie genre. A cop fighting his way through a zombie apocalypse. Soldiers on a mission when zombies suddenly attack out of nowhere. An average, nondescript office worker suddenly faces a threat the likes of which he’s never faced before in his humdrum life. People who become zombies via the Internet. (Insert joke here.) Zombie-fied literary classics that will make your snooty college English professor pop a monocle. Zombies in the past. Zombies in the future. There’s even a couple of zombies who defy their nature to the point where you might not mind being pals with them. If you love zombies, this is the place to be in October. 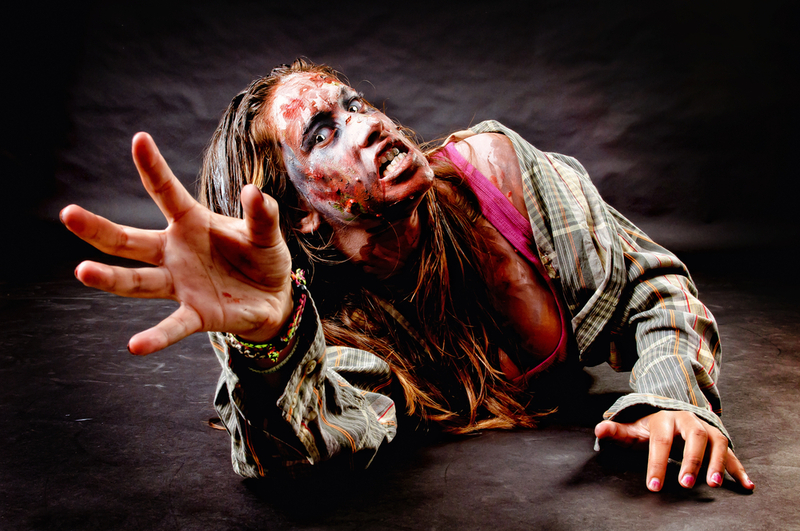 The latest post from Bookshelf Q. Battler’s Zombie Apocalypse Survivor’s Journal. That’s right. Zombies are going to attack East Randomtown and I will update you, the 3.5 readers, every step of the way as my friends and I search for safety. The Zombie Author Interview of the Day – At great personal risk, I will take a break from my survival efforts once a day to “call” and interview an author of zombie fiction. I’m not trying to make myself out as some kind of hero, 3.5 readers, but just remember what I’m putting myself through here for your entertainment when it comes Leibster Award time. Do you think that old lady blogging about her buttermilk biscuits on the blog next door is going to fight zombies and interview zombie authors for you? I think not. Every Sunday, Schecky Blargfeld, Zombie Comedian will perform his act live from the East Randomtown Chuckle Barn. He’ll review the past week’s interviews and tell you who’s stopping by the blog in the week ahead. This funny zombie will leave you in stitches, and that’s not a pun. Zombie lovers, do you know anyone else who’s lined up thirty-one zombie authors? No. ON TWITTER – Tweet your questions to @bookshelfbattle. ON WATTPAD – Pose your inquiries to @bookshelfbattle and follow along as I will be posting excerpts from Bookshelf Q. Battler’s Zombie Apocalypse Survivor’s Journal over there a few days after doing so here. You’ll still have to come here for the author interviews though. On Google Plus – ask your questions here. 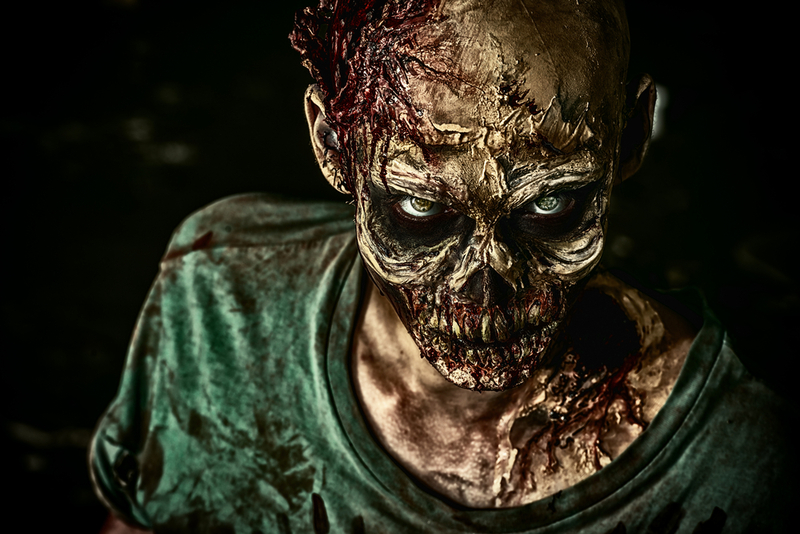 NOTE: As you can imagine, Halloween season is the busiest time of year for a zombie author, so I don’t want to guarantee that they’ll be able to answer your questions about zombies, but in the event they can’t, I will! If you’re having fun, please tell your friends! The more zombie fans the merrier. Let’s rock this blog’s stats to the point where I have to retire the 3.5 readers joke. I couldn’t have done this without you, 3.5. A blogger needs an audience and I couldn’t have put this together without being sure that at least 3.5 of you would show up. Please pat yourselves on all 3.5 of your backs. Attorney Donnelly notes that the Bookshelf Battle Blog disclaims any and all liability for anyone who is eaten by and/or turned into a zombie. You step into a zombie apocalypse, you take your chances.